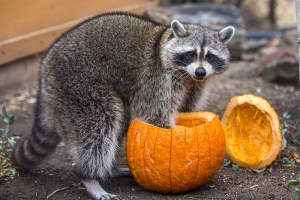 Fall is for feeding the birds! Dark-eyed Juncos are birds of the ground. They can be found hopping around the bases of trees and shrubs in forests or venture out onto lawns looking for fallen seeds. You'll often hear their high chip notes while foraging, or intensifying as they take short, low flights through the vegetation. They are primarily seed-eaters, with seeds of chickweed, buckwheat, sorrel, and the like making up about 75% of their year-round diet. At bird feeders they seem to prefer millet over sunflower seeds. During the breeding season, Dark-eyed Juncos also eat insects including beetles, moths, butterflies, caterpillars, ants, wasps, and flies. Female Juncos build the nests, using her beak to weave together materials and her body to give the nest its shape. Nests can be quite variable depending on where they are built. Sometimes ground nests get just a fine lining of grasses or pine needles. Other nests may be built on a foundation of twigs, leaves and moss, then lined with grasses, ferns, rootlets, hair, and fine pieces of moss. The nests usually take 3-7 days to build. It's rare for a junco to reuse a nest. One of the most abundant forest birds of North America, in Reno & surrounding areas you'll see Juncos on woodland walks as well as in flocks at your feeders or on the ground beneath them. The Dark-eyed Junco is one of the most common birds in North America and can be found across the continent, from Alaska to Mexico, from California to New York. A recent estimate set the Junco's total population at approximately 630 million individuals. For more information on Dark-eyed Juncos, visit one of the three Moana Nursery store locations: 1100 W. Moana Ln. & 11301 S. Virginia St., Reno and 7644 Pyramid Hwy., Sparks. - The Dark-eyed Junco is currently divided into six distinct populations that include the following: Oregon, Pink-sided, White-winged, Slate-colored, Gray-headed, and Red-backed Juncos. There are an additional 12 subspecies divided among these populations. - The Dark-eyed Junco has been documented to produce hybrids with White-throated Sparrows. - Dark-eyed Juncos are often called "Snowbirds," possibly due to the fact that many people believe their return from their northern breeding grounds foretells the return of cold and snowy weather. Another possible source of the nickname may be the white belly plumage and slate-colored back of the junco which has been described as "leaden skies above, snow below." - Juncos spend the entire winter in flocks averaging in size from six to thirty or more birds. - Dark-eyed Juncos tend to return to the same area each winter. 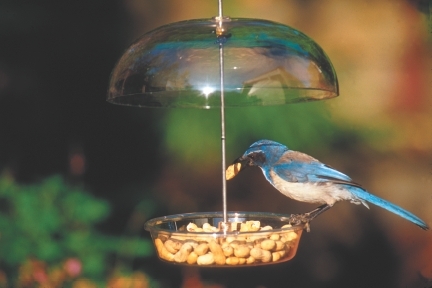 Chances are that you have many of the same birds at your feeder this winter that you had in previous years. 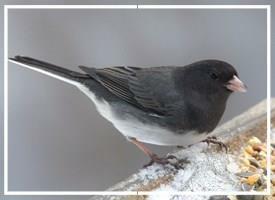 - Visiting flocks of juncos will usually stay within an area of about ten acres during their entire winter stay. - Male juncos tend to spend the winter farther north in order to shorten their spring migration and thus gain the advantage of arriving first at prime breeding territories. - When migrating, female juncos move south before the males do, and adult females leave before the young females. - Juncos migrate at night at very low altitudes and are susceptible to collisions with communication towers and other structures. - Each winter flock of juncos has a dominance hierarchy with adult males at the top, then juvenile males, adult females and young females at the bottom. 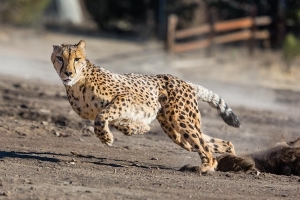 You can often observe individuals challenging the status of others with aggressive displays of lunges and tail flicking. - Juncos have over 30% more feathers (by weight) in the winter than they do in summer. - Juncos prefer to roost in evergreens at night but will also use tall grasses and brush piles. They return to the same roost location repeatedly and will share it with other flock mates, but they do not huddle together. - The name junco is derived from the Latin word for the "rush" plant found in wetlands. - Partners in Flight currently estimates the North American population of Dark-eyed Juncos at approximately 260 million, second only to the American Robin in overall population size in North America. A separate research paper estimates that the junco population could actually be as high as 630 million. 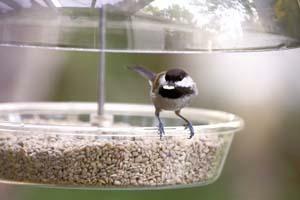 - According to Project Feeder Watch, juncos are sighted at more feeding areas across North America than any other bird. Over 80% of those responding report juncos at their feeders. - Juncos, along with some other members of the sparrow family, practice an interesting foraging method called "riding." They fly up to a seed cluster on the top of a grass stem and "ride" it to the ground where they pick off the seeds while standing on it. - Juncos are known to burrow through snow in search of seeds that have been covered over. - On an annual basis, a junco's diet is made up of approximately three parts seeds to one part insects. During the nesting period, the percent of insects can increase up to 50-60% of their diet. - You may not like these weeds in your yard, but the seeds of chickweed, ragweed, knotweed, pigweed, lamb's quarters and crabgrass are some of the main natural seed sources used by juncos. - You can attract juncos to your yard by feeding a seed blend containing millet and hulled sunflower seeds. - Male juncos return and reclaim the same breeding territory year after year. - Juncos typically have two broods per year with the female building her nest on or near the ground and laying three to five eggs. The male does not incubate the eggs but does deliver food to the young and helps the female to defend against predators. The young leave the nest in 9-12 days. - Studies have shown that Dark-eyed Junco's nests are the victim of predators between 20-80% of the time. Rodents such as chipmunks and deer mice are probably the major predators on the eggs of juncos. 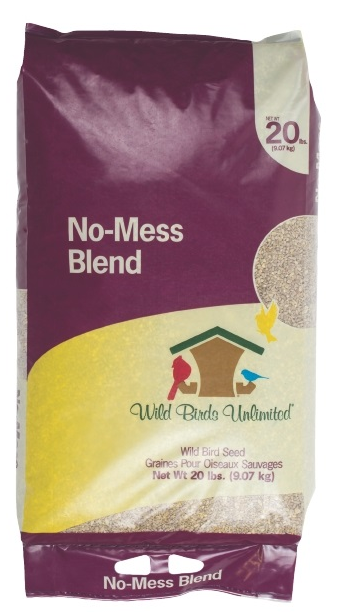 Wild Birds Unlimited Freshest Bird Seed in Town! Red Hot Seed Prices Oct 2-15! 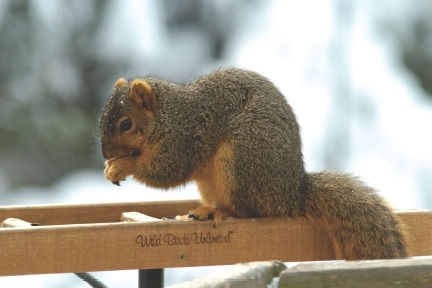 Squirrels & Jays LOVE Peanuts! 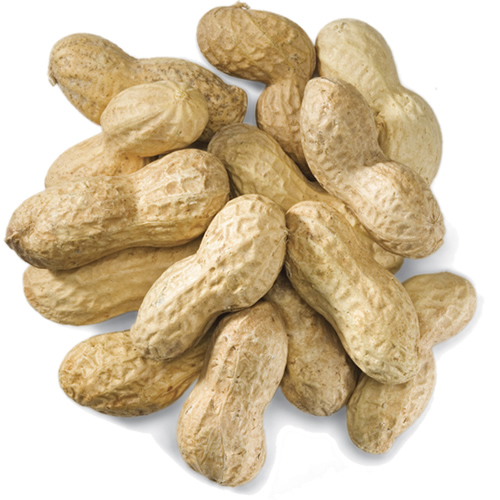 Now we carry 25# bags of Whole Peanuts for sale in all 3 stores! they are seen in communal flocks through out the winter. Lincoln's) join the ubiquitous House Sparrow at ground feeders. * Sparrows can be seen scratching for fallen seeds in fading gardens. * Orionids meteor shower is late-October. * This is the month to install and repair nest boxes for use next year. * Waterfowl migration continues to build throughout month. * Peak of raptor and hawk migration. * Nest boxes need to be cleaned out this month to prepare for winter roosting. * First juncos can appear late in the month. * Remaining hummingbirds will depart this month. * Beavers are very active in the evenings while caching a winter supply of food. * Autumn colors peak in October. * Brown and Brook Trout spawn.